It's all starting to sound like a recording: sales down, profits up. In terms of the Imaging business, that's been the trend and the first quarter of the new fiscal year is no different: revenue down 13%, profit up 63% when comparing this year's quarter to last year's. "the D850...exceeding the sales forecast in all regions." This gives some credence to Nikon's professed drive to go high-end. I write "some" because the D3400 is still the overall sales driver of camera sales for Nikon. Giving up the D3400 volume would be tantamount to reducing ILC sales by as much as half. Nikon's words include the ubiquitous Japanese boilerplate "product mix has been improved." "decrease in...marketing [expenses]...and defer[al] of advertising expense." If you're not seeing Nikon advertising, you're not alone, and it's getting worse. The upcoming mirrorless campaign is almost certainly what was deferred. Imaging product inventories have been on a long downward trend (15.3% down in four years) and continue that direction. If you thought inventories on some Nikon products was already tight, I don't see things getting any looser soon. Nikon is trying to reduce production to what they see as demand, it appears. R&D expenditures are significantly up as a percent of revenue (fairly flat over the past few years in dollar terms), and surprisingly, the Imaging business is the biggest aspect of that and growing. Clearly Nikon is investing in the Imaging business' future, but it's difficult to tell what that will produce. 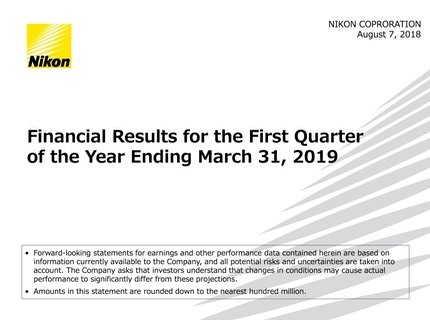 For the full fiscal year (ends March 31, 2019) Nikon hasn't changed their previous forecast (made in May), which is a bit suspicious to me, and for a couple of reasons. First, a number of new product launches have been pushed back, yet that doesn't seem to change the numbers. Second, the unit volumes Nikon forecasts, both their own and CIPAs, don't look correct. The Nikon-own numbers aren't moving, while the CIPA numbers seem understated. Overall, it's the same story for the Imaging business in the future according to Nikon, though: revenue down (11.3%) and profits up (9.3%). That's on ILC camera volume falling another 12%. I mentioned those CIPA numbers. Nikon cites 10m ILC units to determine their market share (23% according to Nikon). But CIPA's current 2018 calendar year forecast is 11.3m, and while Q1—in this case 2019 to match Nikon's forecast—is often the lowest volume quarter, to reach the number Nikon put in their forecast for ILC overall the first quarter of 2019 would have to be an absolutely dismal 1.2m ILC units (by contrast, this year's first quarter was 2.4m units). Or sales would have to tank considerably under the CIPA forecast numbers for the 2018 calendar year, which doesn't seem to be happening (trailing year numbers look stable). If Nikon hits their forecast ILC volume and if Q1 of 2019 equals Q1 of 2018 in terms of overall market volume, then Nikon's market share falls further to 20% of ILC. They were 24.3% by my measurements in 2017.